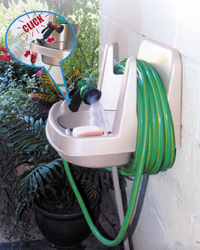 The ideal outdoor water station with a 150ft/50m standard garden hose capacity. the garden sink and hose hanger can be installed onto any outside wall, Garage, shed or stable etc, comes complete with drainage hose and fittings for easy installation. Manufactured from strong UV Stabilised plastic for years of maintenance free service.